Who doesn’t love Brew Tours?? Especially at Carlsberg! I’ll admit loud and clear, that I’m a gal who loves her beer!! Stouts and Porters are definitely my go-to, but when I’m traveling I just want to taste the local refreshments and see what all the fuss is about. When I was in Ireland, it was the Guinness Storehouse and when I was in Prague, it was a 3-stop free beer tour. A few months ago in Copenhagen, my sister and I decided to check out Carlsberg Brewery. Travel Tip: Take a cab! We took the Metro and got turned around a few times. Maybe too many beers?? You really can’t miss it! It’s a very tall brick building and at the bottom, it appears as if it’s being supported by four elephants. 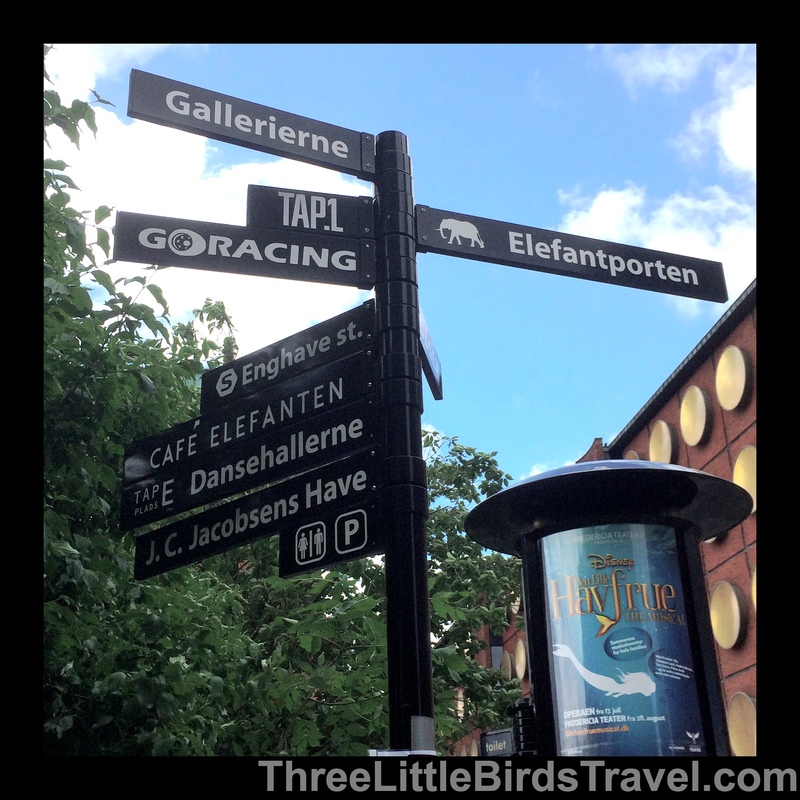 Each elephant has an initial of Carl Jacobsen’s four children. Neat! On to the beer tour! You need to find the main entrance/brand store building. Once you walk in, you’ll instantly be hypnotized by all the Carlsberg merchandise you can buy including clothing, magnets, soccer balls and glassware. They even sell the actual beer in ready-to-take cans! Walk up to the sales clerk and buy your ticket to the self-guided tour. They will hand you a fancy sticker and on you go! Once inside the museum, you’ll see a fascinating timeline of the history of Carlsberg beer. You’ll also get a glimpse of the machinery, delivery vehicles, stables with the famous Jutland horses and even a miniature stature of the Little Mermaid! It’s quite extensive. For more pictures on this part, check out my Carlsberg Brewery Pinterest page. By far, the most awe-dropping part about this tour was walking up the stairs to a whole floor dedicated to the “World’s Largest Collection of Unopened Beer Bottles.” Seriously people…this is massive!!! Right now, there are 22,346 bottles housed here for you to gawk at. I was even lucky to find a Guinness Stout! The whole tour took us about 45 minutes, but that’s only because we spend 20 minutes salivating at all the beer bottles mentioned above! It’s fairly quick if you just run from room to room. I do recommend following the timeline and checking out every part of this museum. After the tour, it was time to relax over some delicious Carlsberg beers. You get two free beers with your tour ticket. If you’re lucky, they will have the famous Jutland horse out for you to enjoy! What brew tours have you been to? Share your stories in the Comment field! « Whale, Reindeer and Meatballs…OH MY!! This is really cool. I love breweries and beer tours. Carlberg is also one of my favorite non-microbrews. Looks like there’s lots of choices inside. Thanks for sharing. Thanks! Yes, it was a lot of fun and unique. I would definitely make a point to go if you’re in Denmark!